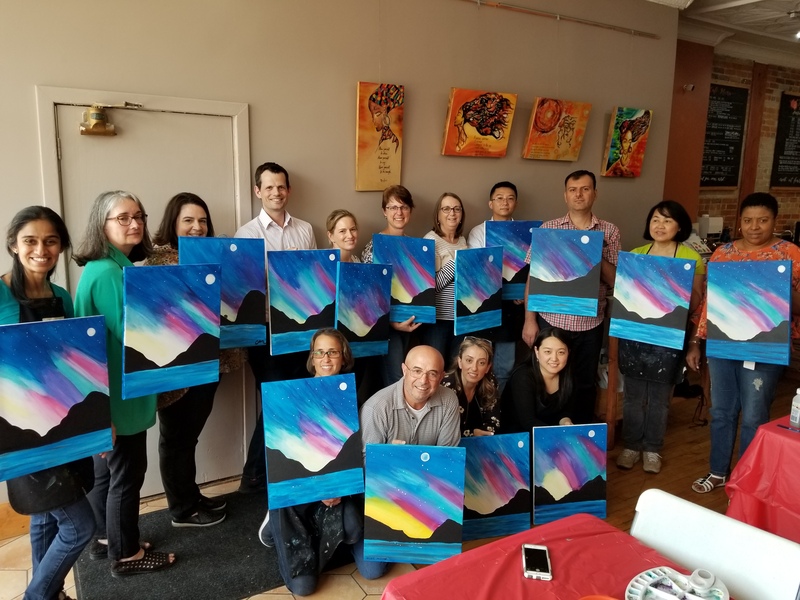 Fresh Paint Studio’s corporate team building activities and events provide an opportunity for staff and organization members to use art as a platform to think outside of the box in a creative and collaborative manner. We can create a customized art project for your team to work on collaboratively or we can develop an art workshop for team members to create their own individual pieces of art. We pride ourselves in developing creative ideas to help inspire artistic projects and we can also incorporate music and poetry into your creative company project. All projects can be created on canvas or birch wood panel. We have a variety of fresh and creative corporate team building ideas that will make your next event a success! Why choose painting for your next team building event? Corporate painting sessions, bring your team together in a fun and creative way. Painting allows each team member to take home a tangible memento of a their time together. Painting together evokes a sense of pride and accomplishment in having completed a creative piece of art. A party isn’t a party until the kids have had a chance to get creative! Plan something different for your child’s next birthday party by letting Fresh Paint Studio host one of our painting parties focused on creativity. Each child will have their own 9x12 sized canvas to create their masterpieces on. We have a variety of painting party packages to choose from including glass painting, slime art, LEGO art, sand and stone art, T-shirt art and more! Watch our Glow Slime Video. We can also customize your party to meet your child’s interests. We have done customized Star Wars parties, Unicorn parties and Minecraft parties in the past. Our parties are 1.5 – 2 hours in length. Each party is split into art time and party time which can include cake, pizza and snacks. Pricing starts at $25/painter (minimum of eight painters and maximum of 25). What else would be more fun? Group painting parties are a real experience. Creating collaboratively is a fun and rewarding process that can produce some really inspirational artwork. Group painting is excellent for individuals who would love to create a collaborative piece of art or great for a bunch of friends, family or co-workers that want to create a collective piece of art together. We offer group painting parties for corporate team building events, bachelorette parties, bridal showers and more. During our art parties, your group can paint on a large canvas and do a collaborative piece or everyone in the group can paint on their own individual canvas. We have a team of talented artists who can design a customized creative group painting session for your group. Our goal is to ensure that each participant has a memorable and creative experience. Painting parties include canvas painting (collaborative and individual), wine glass painting, framed glass painting parties, and much more. If you have a large group that would like to have a painting party at the studio, please contact us for pricing. Fresh Paint Studio + Café is not your typical art studio venue. We have an open studio space where kids can have fun creating their art as well as a relaxing lounge space for parents to enjoy some adult time. During the party, parents can sit in our lounge area and enjoy a coffee or tea while the kids create! Once the kids have done their own individual art pieces, you can have them work on a collaborative canvas for the birthday girl or boy to take home. Collaborative canvases are done on 18x24 sized canvases and cost: $35.00. Our art parties are focused on keeping your kids engaged and happy! We also offer a free tattoo station as well as a free finger painting station as an option. Please let us know before your party if these options are of interest.